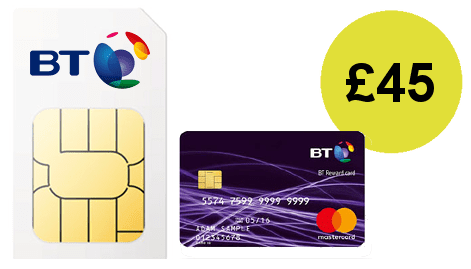 We show you how to get the highest value BT Mobile Reward Cards when you order a SIM only deal or smartphone contract from BT. SIM Sherpa is your trusty guide. Last updated: April 19th 2019. What terms and conditions are there? All offers are subject to change and removal by BT Mobile so please always double check their terms and conditions before you order. 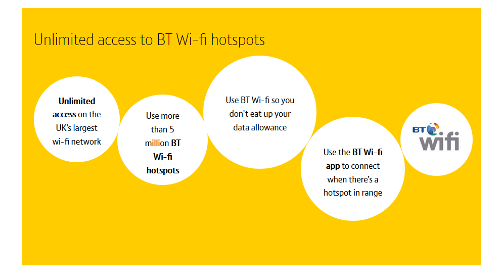 All pricing is based on BT Broadband customer £5 discount applying. 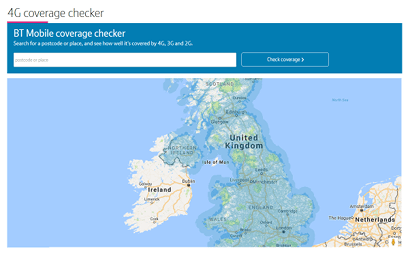 We already rate BT Mobile highly because of their reasonably priced SIM only and smartphone plans that get you access to EE's superfast network with the UK's best coverage. Order a selected SIM only or smartphone plan before the April 25th 2019 23:59 deadline and you’ll qualify for a pre-paid BT Reward Card, a pre-paid Mastercard you can spend practically anywhere. 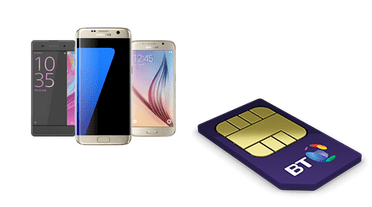 In the next section, we pick through each product type and pull out the precise value of card you can claim for SIM only plans and phone contract. Where to next within this article? 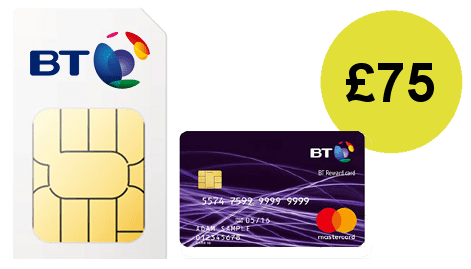 At the moment, there's a Reward Card available with each of BT Mobile's SIM only deals. 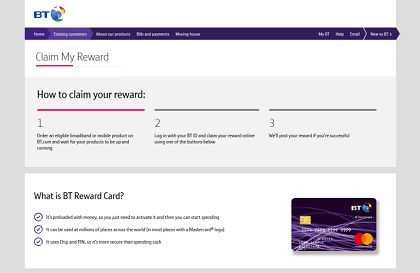 We've been tracking BT's Reward Card offers on phone contracts since they first started. And this week sees the largest number of plans included the offer, and Mastercards at the higher end of value. 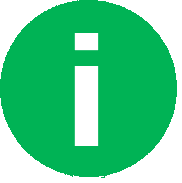 Order a smartphone in the week ending April 25th 2019 and you'll be eligible to claim a Reward Card most plans, apart from the very cheapest basic ones. 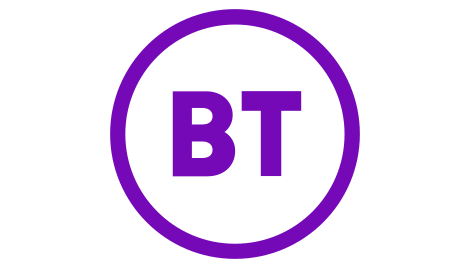 BT Mobile stock all the latest iPhone models, including the brand new iPhone XR, iPhone XS and iPhone XS Max devices. And a pre-paid Mastercard is available with every model, on every plan. 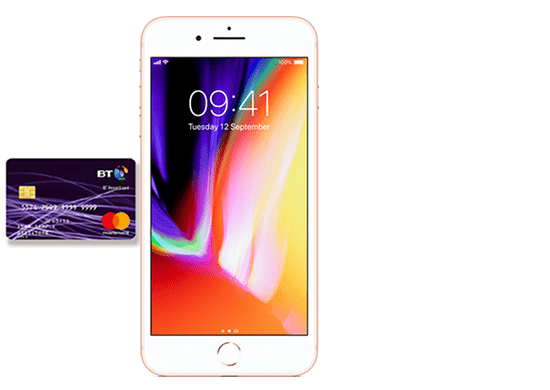 Claim your Reward Card by ordering your chosen iPhone model on a 1GB plan for a £30 Mastercard, a 3GB one for a £45 reward, 6GB for £60, plus on top models 30GB for £85 and 60GB for a £95 reward. Each Reward Card can be combined with other offers running on selected iPhone models too. There's a decent range of Samsung Galaxy phones on BT Mobile to fit most monthly budgets, including the latest Galaxy S9 and S9 Plus models. 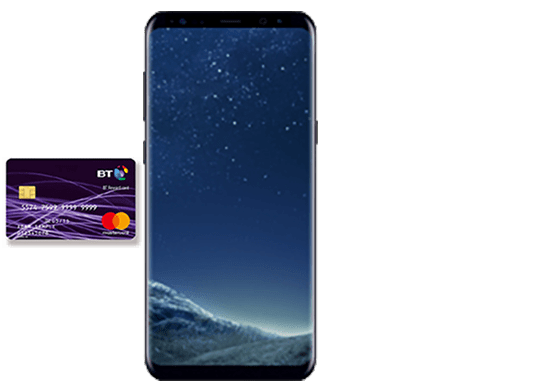 Order on a 1GB plan for a £30 Reward Card, 3GB for £45, 6GB for £60, and on top-end models 30GB for the largest £85 value. You can combine the pre-paid Mastercard offer with other offers on BT at the moment. 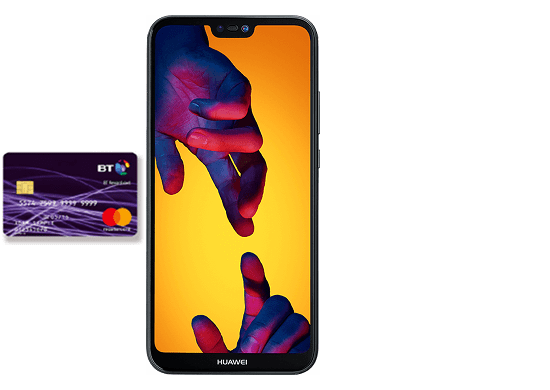 Take either the Huawei P20 Pro, Huawei P20 Lite or Huawei P Smart on a 1GB plan for a £30 Reward Card, a 3GB plan for £45, 6GB for £60, or 30GB for £85 on the P20 Pro only. 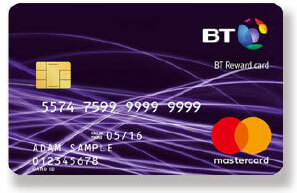 As with all other phones, you can combine the Reward Card offers with other offers on BT as well. Last but by no means least is the only Sony Xperia handset in BT Mobile's range, the mid-range L3. 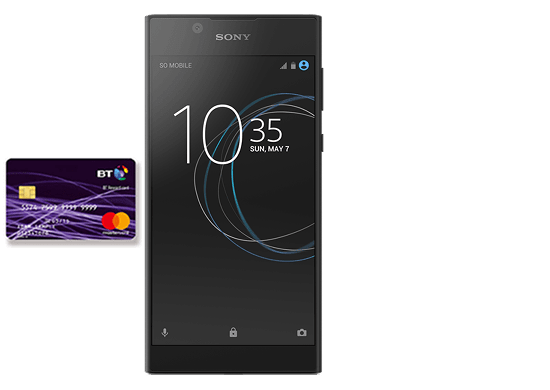 Order it before the deadline and you're able to claim a £30 Reward card on the 1GB plan, £45 on the 3GB and £75 on the 15GB plan. The Reward Card doesn't just get delivered automatically with your SIM or phone order. There are a few hoops you'll need to jump through to claim yours. Your pre-paid Mastercard should arrive within 20 days of claiming. IMPORTANT: you must claim your Reward within 3 months of activating your BT Mobile SIM. After that the offer expires and you won't be able to claim. 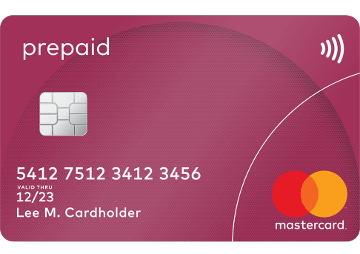 The BT Reward Card you'll receive after you've claimed is essentially one of these pre-paid Mastercard debit cards (with some nice BT branding of course). It'll come pre-loaded with an amount of credit that you can then use to pay for anything where Mastercard is accepted. That could be online shopping, purchases on the high street or even paying household bills. It's essentially some free money on a card. You can't however just rock up to a cashpoint and take out the cash, you have to spend it electronically. That said, it's practically as good as receiving cashback off BT for signing up to there deals, so we rate this as an excellent offer overall.